The sunrise was loudly cheered by crowds at the Neolithic site. Thousands of people cheered the sunrise at Stonehenge on Thursday morning to celebrate the summer solstice. The summer solstice is upon us but what is it? And where are the best spots in the West Country to see the sun rise? The tunnel is one of several ideas being considered to upgrade the road. The route has been published for the A303 upgrade near Stonehenge - a key part of the ‘South West expressway’. Police say yesterday's summer solstice celebrations at Stonehenge were peaceful - despite the armed presence following the terror attacks. Thousands of people are gathering at Stonehenge to watch the sun rise tomorrow morning ahead of the longest day of the year. 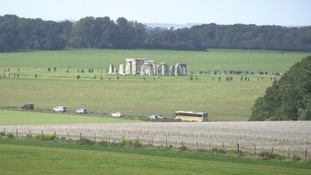 In recent weeks, 21 experts on Stonehenge have joined together in their objection to the A303 tunnel scheme proposed by Highways England. Plans to improve the road were initially released two years ago but public consultation on the latest proposals begin today.